The Platte River and its floodplain support a variety of aquatic and terrestrial ecosystems that provide habitat for a variety of species. 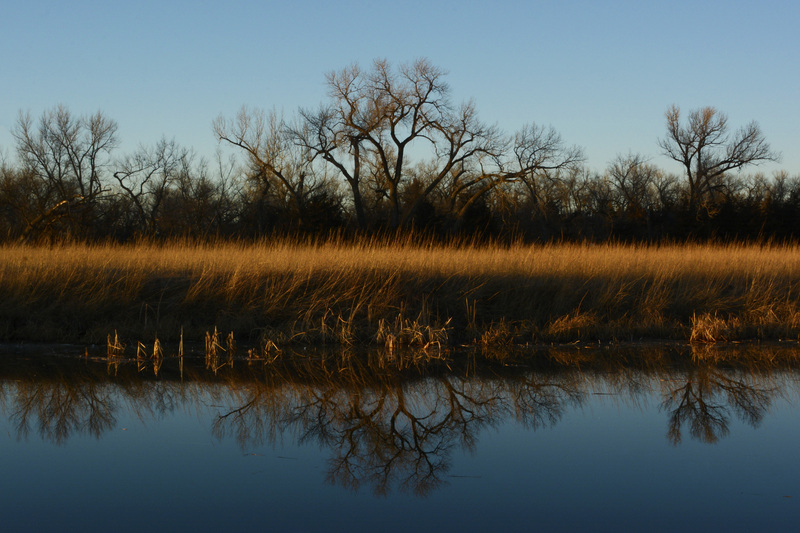 Wetlands, grasslands, and woodlands are examples of some of the habitats found along the Platte. What is a wetland? Wetlands are the link between land and water, providing a biologically diverse and highly productive ecosystem that supports a rich food web for insects, amphibians, reptiles, birds, and mammals. Wetlands and grasslands (next chapter) provide critical habitats for a variety of both aquatic and terrestrial organisms. These habitats are interconnected and form an ecosystem so what happens in one system impacts another. Although the boundary between land and water is somewhat artificial, it’s a useful way to understand these habitats and their unique characteristics. What are wetland functions? Wetlands provide habitats for many animals, including beavers, topminnows, and caddisflies, as well as plants such as cattails. 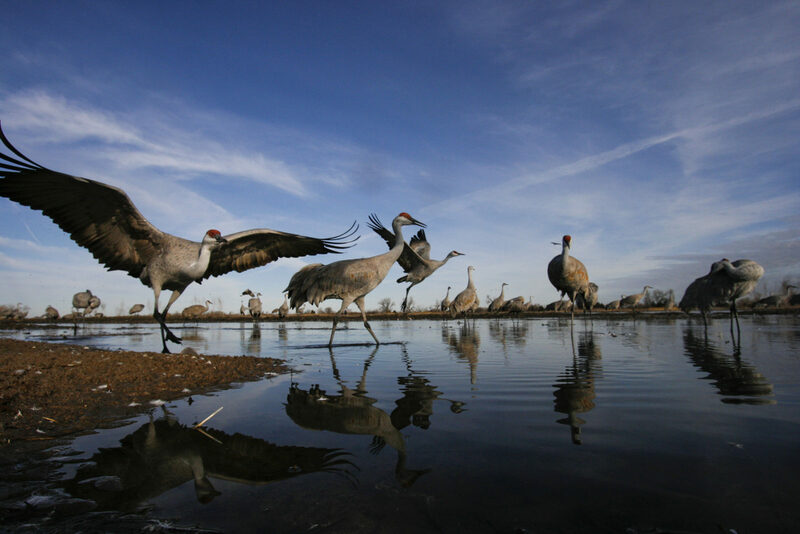 Wetlands also provide important habitats for migrating birds such as Sandhill Cranes. The wetland ecosystem is a significant source of food, water, shelter, and nesting habitats for otters, bobolinks, raccoons, and meadow voles. The U.S. Fish and Wildlife Service estimates that up to 43 percent of federally threatened and endangered species rely directly or indirectly on wetlands for their survival. 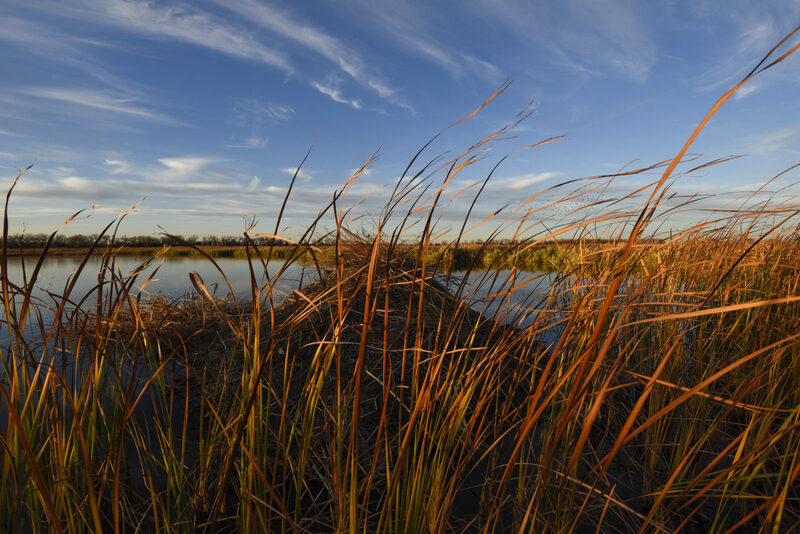 Why are wetlands important? Aside from providing a rich habitat for a variety of species, wetlands also act as a natural filter by cleaning and storing water, which helps protect against flooding, especially in agricultural areas. Wetlands are an incredible outdoor laboratory for studying vegetation, biodiversity, and plant-animal interactions. What is a grassland? Grasslands are what their name suggests: land dominated by grass with few trees. Grasslands are more diverse than rainforests and are far more threatened. Yet, less than eight percent of grasslands worldwide are protected. 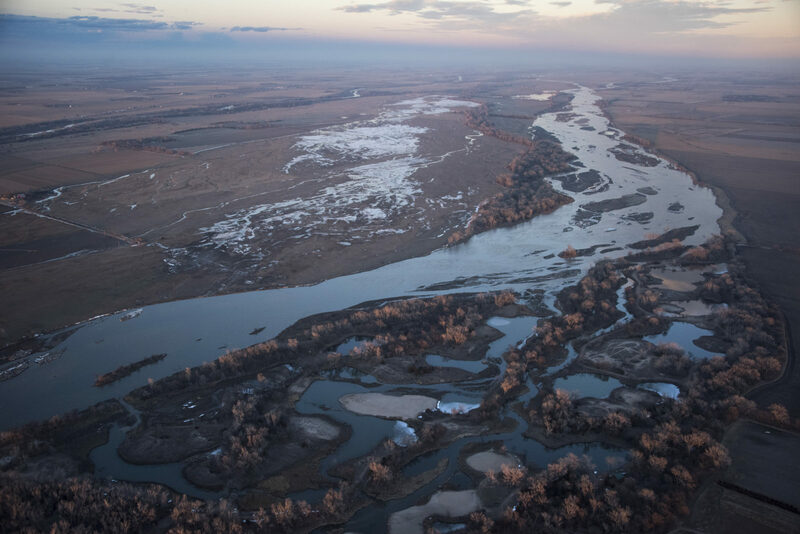 Some of the Platte River Prairies in Nebraska have been protected and restored, but many more acres still need protection. Both dry (xeric) and wet (mesic) prairies provide benefits that often go unnoticed. Prairie plant roots have massive root systems that may stretch as far as 10 feet deep. These roots help to slow runoff and decrease the impact of flooding by reducing soil loss and rebuilding soil structure. Watch this video to learn about the importance of vegetation on a prairie. 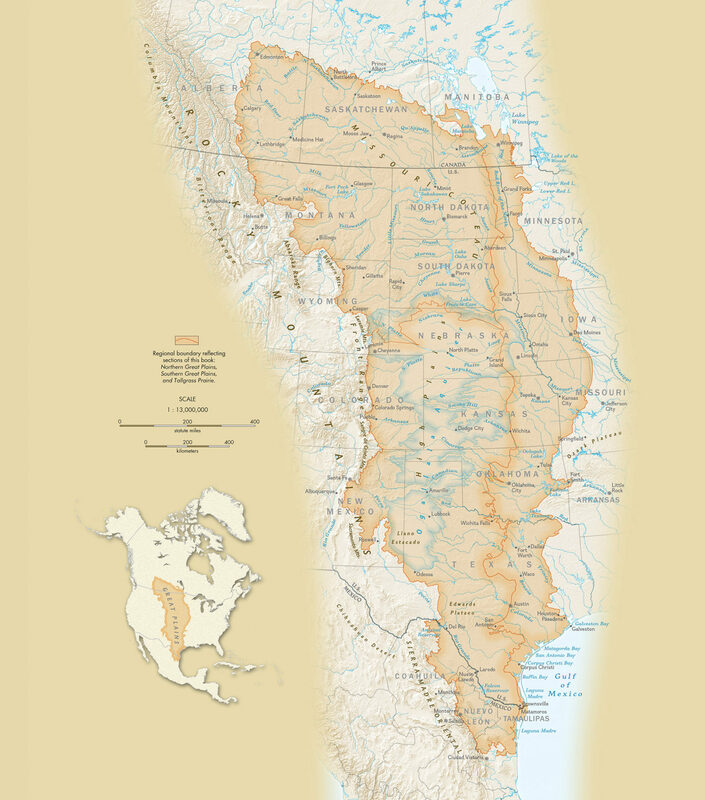 This map of the Great Plains shows bioregion boundaries reflected in sections of the book titled Great Plains: America’s Lingering Wild by Michael Forsberg. These geographic areas are unique in their combination of plants, animals, geology, climate and water features. A Map of the Great Plains. Bioregion boundaries were modified by The Nature Conservancy based on ecoregional subsection lines. Source: Bailey, R.G., P.E. Avers, T. King, and W.H. McNab, eds. 1994. Ecoregions and subregions of the United States (map). Washington DC: USDA Forest Service. What are grassland functions? Grassland ecosystems provide valuable habitat for diverse species of plants and animals. To maintain this diversity and to protect one of the most imperiled biomes on Earth, land management techniques such as grazing and fire are used. Grazing and roaming animals, including bison and some cattle, make grasslands their home. These animals are well adapted to the rewards and challenges of life on prairie grasslands and are important in maintaining the biological diversity there. Controlled fires also help to promote plant diversity and prevent the growth and spread of trees and shrubs onto the open prairies. Without grasslands, birds such as Dickcissels, Bobolinks, Meadowlarks, Grasshopper Sparrows and Henslow’s Sparrows would have a hard time surviving. Many songbirds rely on prairie habitat for food, protection, and nesting. They winter as far away as Central and South America and then migrate thousands of miles before arriving on the Platte River Prairies in the spring. Grassland birds are in steep decline because their habitat is fast disappearing. Grasslands also provide important habitat for insects and pollinators such as the monarch butterfly and the regal fritillary. What is a woodland? Platte River woodlands are sparse forests with trees and shrubs that are are either native species, such as cottonwood trees or willows and non-native or introduced species, such as western red cedar. Many native plant species are attracted to water or require moist soil to establish their roots. See the map/aerial showing an abundance of small woodland forests surrounded by open meadows. What are woodland functions? Prairie Woodlands operate as an important habitat for raptors, such as eagles, hawks, and owls, and mammals, such as bats, foxes, coyotes, and deer. The treetop canopy provides a cool, moist, dark shelter for these animals. As generalists, these animals move freely across all habitats in search of food. Why are woodlands significant? 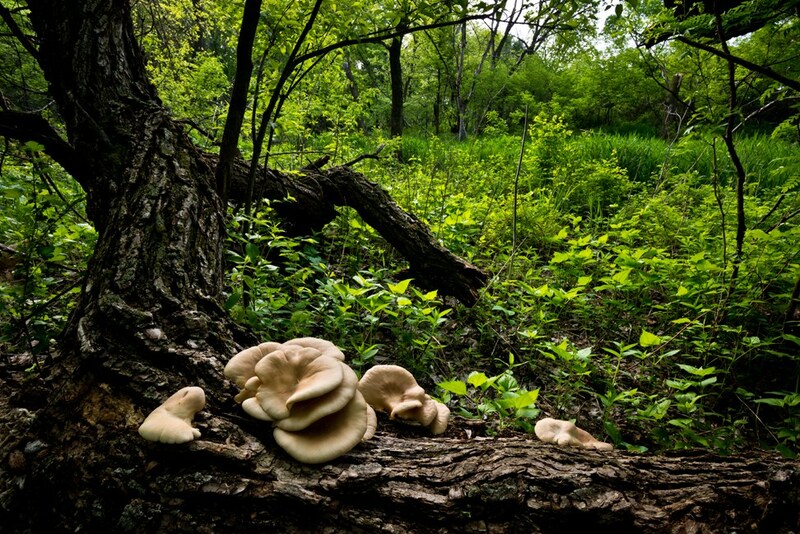 Woodlands are an important part of the dynamic ecosystem of the Platte River prairie. This habitat provides necessary shelter from the wind, cooler temperatures, and water for plants and animals. Cavities of decaying wood provide microhabitats for insects, birds, and mammals to live and forage. Dead trees are critical to the woodland ecosystem and signal its overall health, as they provide nutrients, release nitrogen, and store carbon dioxide.  To learn more about the importance of woodlands, watch this interview with Dr. Tala Awada, Professor, School of Natural Resources and Associate Dean, Agricultural Research Division at the Institute of Agriculture and Natural Resources, University of Nebraska-Lincoln.